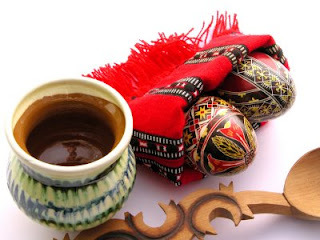 Orthodox Easter this year is 27-28th April - at the end of next week. So the next entries will be dedicated to Romanian Easter traditions you are probably not familiar with. Easter is the most important religious celebration in my country. Its traditions go beyond the Christian dogmas, to pagan rituals, myths of creations and symbols of life. I am not going to talk about the preparations in detail. I give you another gift instead: a legend and Romanian painted eggs. From now on you shall paint the eggs in red to remember my crucifixion. According to this legend, there should be no other colors used to paint the eggs for Easter. But as you know, Christians like to paint eggs in many other colors. No, I wouldn’t say that’s a sin or a blasphemy. The meaning of Easter is preserved, no matter what colors we might choose. 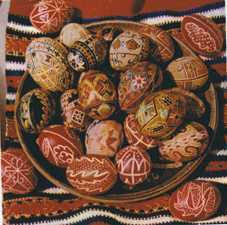 In Romania the tradition of decorating eggs is ancestral. In some parts of Romania (especially in the North in a region called Maramuresh - where you can also find the Wooden Churches and the Merry Cemetery from Sapanta), newly wedded couples keep painted eggs in their homes as charms to protect their home, bring equilibrium and secure happiness in marriage. While the Christian symbol of the egg is related to the resurrection of Christ, the primordial meanings are still potted in the motifs, colors and patterns that transform these eggs, as you see, in genuine works of art. Now, I don’t know how to paint eggs in such an incredible manner. This art, although not kept a secret, is not taught in schools: it’s a folkloric legacy, carried from generation to generation, flourishing only in some parts of Romania. So what you see above it’s an example of Romanian tradition, and what you see below it’s an example of … what a Romanian living in Germany does to substitute a missing sacred symbol.